CarGurus has 8,445 nationwide GLA-Class listings starting at $15,495. Once in a while a car really strikes a chord--and the Mercedes-Benz GLA-Class sure has. We were lucky enough to test out a GLA45 AMG last year, and it was it a blast. Needless to say, we're quite happy to see the GLA-Class return for 2016. Launched in 2015, the GLA is a beefed up crossover version of Stuttgart's wildly popular CLA. To create it, Mercedes-Benz took the basic underpinnings of the CLA, lifted them up, and added a wagon body. The result is a raucous little 4-door, 5-seat crossover that can hit 60 mph in just 4.3 seconds. New for 2016, the GLA gets an updated COMAND infotainment system with a 7-inch color display. Automatic dual-zone climate control and keyless ignition will also come standard. Buyers considering the GLA will have 3 trims to choose from—the GLA250, GLA250 4MATIC, and GLA45 AMG. Pick either GLA250 trim and you'll be treated to a 2.0-liter 4-cylinder engine pumping out 208 hp, with front-wheel drive (FWD) on the GLA250 and 4-wheel drive (4WD) on the GLA250 4MATIC. Opt for the GLA45 AMG and you'll find a sublime hand-crafted 2.0-liter 4-cylinder sending 375 hp to all four wheels. All GLA-Class trims employ a 7-speed dual-clutch automatic transmission. GLA250 owners can expect to see fuel mileage numbers of 25 mpg city/35 highway/29 combined, while GLA250 4MATIC owners should expect 24/32/27. The rambunctious GLA45 AMG clocks in at 23/29/25. 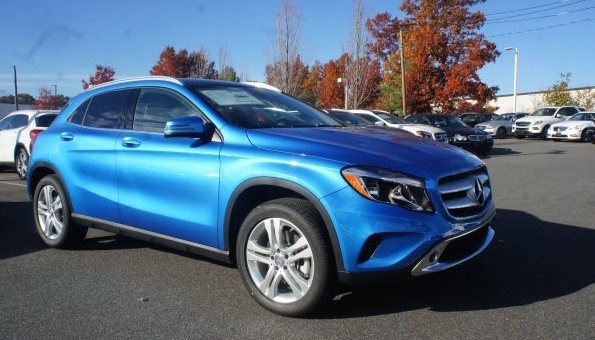 Hop into the GLA250 or GLA250 4MATIC and you'll get a standard power liftgate, leatherette seats, split-folding rear seats, rain-sensing windshield wipers, Bluetooth connectivity, and a 14-way power driver's seat. The GLA250 and GLA250 4MATIC will also boast new Dynamic Select driving modes, allowing you to customize your driving experience. 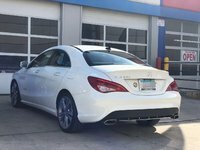 If you're looking for a more sporty ride, they also offer option packages like the Sport Package, which touts perforated front brakes, 19-inch AMG wheels, and sport body styling. You can also select the Night Package, which includes the Sport Package plus black 19-inch AMG wheels and black exterior accents. Those looking for luxury can add a panoramic sunroof and bi-xenon headlights with LED taillights. There is even an optional illuminated Mercedes-Benz star in the front grille, for $550. Sportier types will want to consider the 2016 GLA45 AMG, which should be as much of a thrill to drive as the 2015 version was. On the inside, look for leatherette/Dinamica suede seats with 12-way power front seats. Other perks include a power liftgate, Bluetooth connectivity, rain-sensing windshield wipers, AMG sport suspension, AMG sport exhaust, and AMG Dynamic Select driving modes. For a few extra dollars, you can also add a panoramic sunroof, red brake calipers, a rear spoiler, and, of course, an illuminated Mercedes-Benz star in the grille. Package options include the AMG Night Package, Exterior Carbon Fiber Package, and Aerodynamics Package. Safety-wise, all GLAs come with Mercedes' Collision Prevention Assistant Plus, which automatically applies the brakes when it judges a collision to be imminent. Brake Assist, also a standard feature, applies maximum pressure to the brakes in emergency braking situations. These features work with the car's electronic stability control and traction control to prevent an accident by all means. If you are involved in an accident, however, it's reassuring to know the GLA Class sports dual front airbags, dual front knee airbags, front and rear side curtain airbags, and front side airbags. All in all, the GLA is a fun little car the deserves some consideration if you're in the market for an entry-level luxury ride that can fit you, up to 4 friends, and up to 14.9 cubic feet of cargo—46.3 cubic feet if you kick 3 friends out. What's your take on the 2016 Mercedes-Benz GLA-Class? Users ranked 2016 Mercedes-Benz GLA-Class against other cars which they drove/owned. Each ranking was based on 9 categories. Here is the summary of top rankings. Have you driven a 2016 Mercedes-Benz GLA-Class?